Mi Compania Dulce; A luxury hideaway in the Gold Country. Drive along the winding valley road, through beautiful vineyards and you arrive at Villa Vallecito Vineyards. 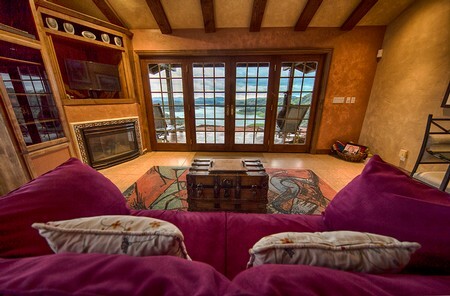 As the wrought iron gates open, you climb to the top of a hill toward your personal Casita "Mi Compania Dulce" As you look to the west you are struck by the awesome sights of New Melones Lake 500 feet below. Your eyes drink in the 360 degree views of water, hills and vineyards in a very private setting. Your one-bedroom Casita is handsomely decorated in old Mexican charm. It comes fully equipped with all the modern amenities including a nicely equipped kitchen and 2 verandas to enjoy the breathtaking views. Visit the many local wineries in Murphys. Tour the historic mining towns, enjoy golf at one of the local courses or ski Bear Valley. 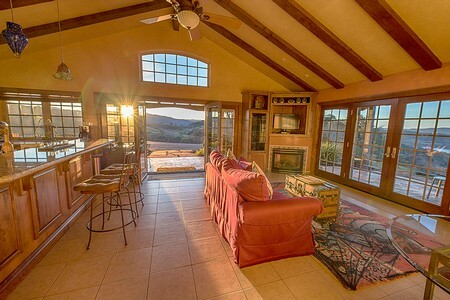 All are within 15-45 minutes of your private secluded hideaway. Villa Vallecito Vineyards grounds are located on steep hillsides and are not suitable for children. A romantic 1 bedroom casita located on the grounds overlooking New Melones Lake, 100 acres of vines and beautiful rolling hillsides. Rates: minimum 2 night stay: $225.00 nightly, cleaning fee, an additional charge of $50.00 for more than 2 guests. "It's almost impossible to try and explain sitting on top of a mountain overlooking a lake on one side with rolling vineyard on the other!...If you enjoy escaping a big busy world and you want some serious scenery and beauty, you've found your place. I'll be back soon enough!" -Jarry D.